Danes Camp Leisure Centre held a patient reunion with Alan who suffered a heart attack while on the treadmill. Pictured l-r: Michael Jinks, Julie Richards, Martin Allinson, Alan Burgin, Jean Tudor, Kathy Farmer and Scott Digby. A 67-year-old man has thanked Northampton gym staff after they saved his life following a cardiac arrest. Alan Burgin, 67, of Horton, was at an over-50s gym class when he suffered a heart attack at Danes Camp Leisure Centre in November last year. Danes Camp leisure centre supervisor Michael Jinks with Alan Burgin and staff member Scott Digby. Staff from East Midlands Ambulance Service have praised the initiative of leisure centre staff Michael Jinks and Scott Digby for starting compressions on Alan, which saved his life. Leisure centre supervisor Michael said: "My instant reaction was to get up straight away and go upstairs to the gym. “We pretty much legged it up the stairs, without any hesitation, got through the gym doors and we went round the corner and Alan was laying on the floor on his side. "At that point, it was a case of my training kicking into gear." Michael immediately turned Alan onto his back and started to perform compressions before calling Scott over with a defibrillator. He added: “I was talking with the responders over the phone who were reassuring us, talking us through it and asking us questions. “Before I knew it they had arrived." 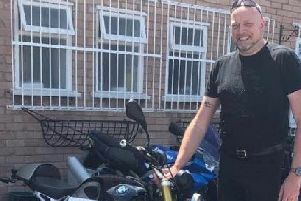 Alan was rushed to Kettering General Hospital where he was operated on immediately and had a stent inserted into a blocked artery to keep it open. Paramedic for EMAS Kathy Farmer was working as part of a double-crewed team with Julie Richards when they received a high alert, catergory red call. She said: "When we got into the gym the gentleman was lying on the floor with a head injury and he was gaining consciousness. He had a few rounds of compressions from the staff and they shocked him with the defibrillator, which had actually saved his life. "As you're approaching the call people who don't have a shockable rhythm or don't have CPR their chances are slim, so interventions really make a difference. "It's not very often that we get to meet people and see them walking and talking. Coming back and seeing him here today is just fantastic. We wear this uniform and we had to stabilise Alan to get him to hospital but they really are the heroes of the day." Alan would attend the gym most days for an hour to keep fit before his operation and had no underlying conditions, or unusual breathlessness for a person of his age. Alan Burgin said: "That morning was just a normal morning - I did my workout on the cross trainer and went on to the treadmill. "I didn't really feel any different to normal, and apparently I had a full cardiac arrest and basically blacked out. The machine was still running and it threw me off the back of the treadmill. I was on the ground. "The staff at the gym were so well trained and professional - they administered compression on my chest and used a defibrillator to get my heart going again. By the time the paramedics came, I had a pulse. From then on I was taken to Kettering General Hospital in an ambulance where they put a temporary balloon in my artery to widen it. "Staff were phenomenal, their professionalism and how quickly they reacted saved my life, there's no question about it."